2016 saw Mehbooba Mufti taking over as the first woman chief minister of Jammu and Kashmir and Army for the first time carrying out surgical strikes on militant camps in PoK while violent protests for months hit hard normal life and resulted in shutdown of schools and death of 86 people. The government had also to grapple with the NIT unrest, mysterious school burning incidents and blinding due to pellet gun firing issues. The only silver lining during all this mayhem was that the annual Amarnath yatra to south Kashmir Himalayas went on, though with some interruptions due to authorities’ stopping the pilgrims from travelling during day to avoid any casualties. In fact, local residents of Bijbehara town defied curfew to help a group of Amarnath pilgrims to hospital after their vehicle met with an accident. The year, however, started with Chief Minister Mufti Mohammad Sayeed, who had cobbled up an unimaginable coalition government between his PDP and the BJP a year earlier, losing his battle against illness at AIIMS in Delhi on January 7. 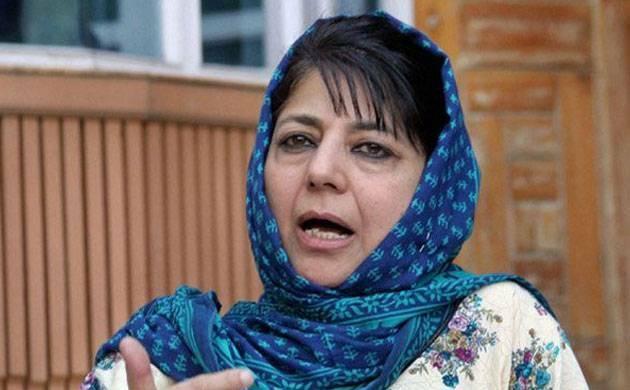 Following Saeed’s death, a smooth transition of power was expected to his daughter and political heir Mehbooba Mufti but the PDP president refused to take charge for over two and half months. As the days passed, it seemed increasingly difficult for the two parties to come together again with the PDP setting some conditions like initiation of the confidence building measures by the Centre. Finally, Mehbooba was sworn in as the first woman chief minister of the state on April 4. No sooner had she assumed office, Mehbooba faced her first real test. An unrest began at NIT Srinagar where students from outside the Valley were accused of beating local students following a tiff over an India-Pakistan cricket match. However, the outside students alleged they were tortured by police inside the campus, sparking off a massive crisis that hogged national headlines for several days. The authorities had to shut down the institute for some time to allow the frayed tempers to cool down. Budget Session of the assembly, stated that it had no such plans. As it appeared that the worst was over for the PDP-BJP government, Hizbul Mujahideen commander Burhan Wani—who had become the poster boy of militancy in Kashmir—was killed in an encounter with security forces on July 8. As the news of his death spread, there was an unprecedented outpour of outrage on the streets of the Valley as rumours were abound that the 21-year-old militant was killed when he was unarmed. The security forces dismissed the allegations. However, violent street protests and clashes between protestors and security forces across the Valley over the next several months left 86 people dead and hundreds—including 5000 security forces personnel—injured. For the first time in the past 26 years of turmoil in Kashmir, over 300 people were blinded as security forces fired pellet guns to quell the protests, leading to calls from various quarters to ban its use. Authorities imposed curfew across Kashmir valley, snapped mobile and Internet services, banned newspapers for three days and took several news channels off air in an attempt to end the street violence but protests continued unabated. The separatists, sensing an opportunity, jumped in and started issuing weekly agitation calendars as they did in 2010. Almost all separatist leaders including Syed Ali Shah Geelani, Mirwaiz Umar Farooq and Mohammad Yasin Malik were either arrested or put under house arrest. More than 8000 people were also arrested on the charges of stone-pelting or incitement to violence. Curfew and shutdowns brought life in Kashmir valley to a standstill as schools remained closed, businesses shut and transport off the roads. The deadly attack at Uri, close to Line of Control, on September 18 prompted perhaps the strongest peacetime reaction from the armed forces against the militants. As many as 19 soldiers were killed at Uri before the Army eliminated the four intruders, who had crossed the LoC just a day before launching the attack. The special forces crossing the LoC into PoK and destroying several militant camps in which over 40 ultras and their sympathisers were killed was a departure from the traditional policy of exercising restraint after every ceasefire violation or an attack on security installation. As the Valley was going through its worst unrest in 26 years, there was an increase in hostilities along the LoC between armies of India and Pakistan. Both sides accused each other of violating the ceasefire in Jammu and Kashmir along the LoC and the international border. September, Singh led an all-party delegation of national parties in an attempt to reach out to all sections of the society to end the street protests. A splinter group of delegation including Sitaram Yechury and Assadudin Owaisi tried to meet the separatist leaders including Geelani but they shut their doors on them saying the visitors did not have the mandate to resolve Kashmir issue. Senior BJP leader Yashwant Sinha led a delegation of ”concerned citizens of India” and met people from all sections of the society here. This time separatists met them and conveyed their viewpoint. Curfew was lifted after the visit of the all-party delegation from many parts of Kashmir but the shutdown continued with no end in sight. The shutdown not only affected the livelihood of the masses but also put a question mark on the future of the students. The government announced that board examinations will be held in November but promised to make it easy for the students. The examinations were held in November with thousands of students appearing and the government keeping its word by giving 50 per cent relaxation in the syllabus. While the unrest is dying out, the educational infrastructure suffered massive damage in the Valley as more than 32 schools were gutted in mysterious fire incidents. The frequency of burning of schools prompted the Jammu and Kashmir High Court to take suo moto cognisance and initiate PIL proceedings, directing the state government to take steps for ensuring safety of the school buildings.